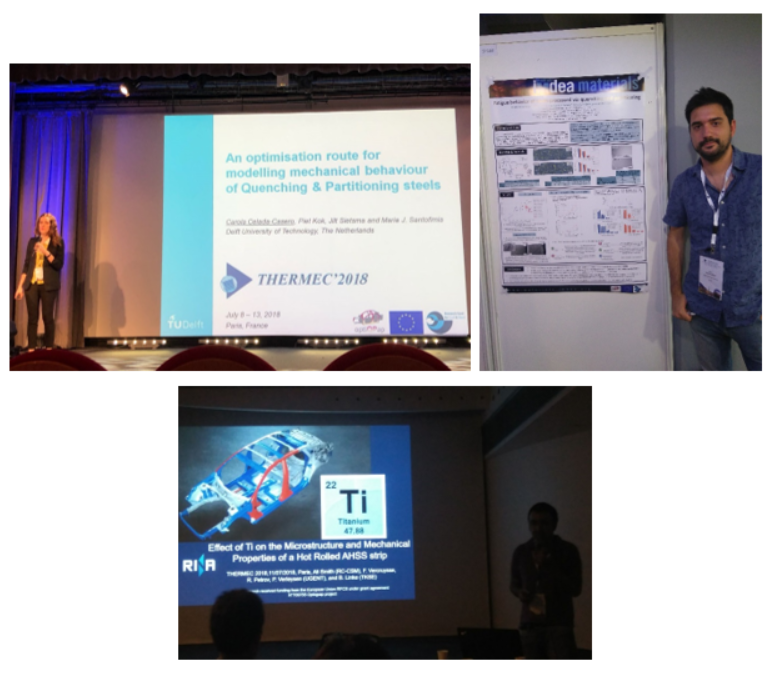 The OptiQPAP consortium members have participated at the THERMEC 2018 Conference, which was held on July 8-13 in Paris. THERMEC Conference is the main international event in the area of thermo-mechanical processing of steels. The recent outcomes of the OptiQPAP project were presented in oral talks and posters. Presentations focused on the role of alloying elements in microstructure evolution in steels developed for quenching and partitioning (Q&P) process, on modelling of mechanical behaviour of Q&P steels and their functional properties. OptiQPAP consortium members presenting at the THERMEC 2018 Conference. From left to right: Dr. Carola Celada (TUDELFT), Pablo Garcia Chao (IMDEA), Dr. Ali Smith (CSM).